The Silicon Labs Si4735 is an IC that handles complete tuner functionality from antenna input to audio output. There are many programmable options available to the programmer, such as frequency, volume, and audio output method. The Si4735 is interfaced over one of three serial connections, 2-wire, 3-wire, and SPI. 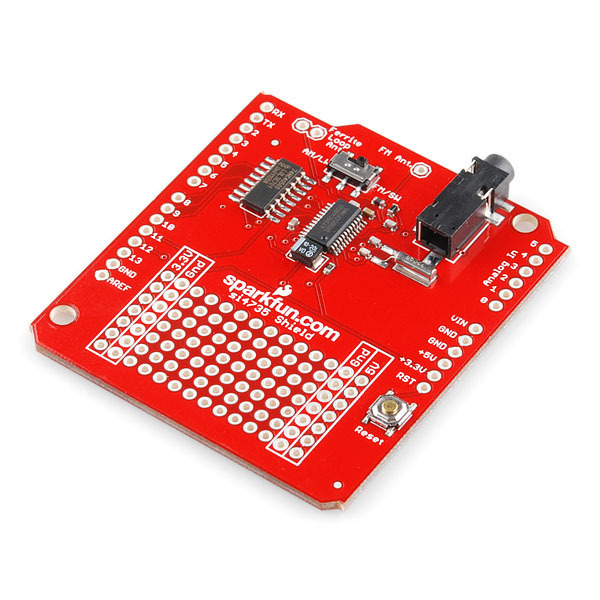 The Si4735 is newly available from sparkfun.com as an Arduino shield, but can be adapted for use in a standard breadboard. The default interface for the Si4735 is over the 2-wire serial bus, which is I2C compliant. This interface was chosen because it is the default and simplifies the power-up sequence. The interface is described in detail in the programming guide. Be forewarned. This shield was designed for the Arduino, which runs it's IO pins at 5V logic. The Si4735 radio IC runs at 3.3V logic, so there is a level shifter buffer (74hc4050) on the data/input lines of the shield. This buffer is mostly unidirectional, and forces the shield to be used in SPI mode, which has a difficult start-up sequence. A majority of response signals from the radio IC over the I2C bus are not transmitted to the shield pins. With this buffer, no acknowledge signal was ever observed by the mbed, and no data was ever transmitted in response to read requests. However, the radio was able to send status responses back through the buffer following every write command. This oddity incorrectly led us to believe that responses to read requests were possible. In order to fully communicate with the radio over I2C, the buffer must be removed from the shield, and the pins for the buffer's inputs and outputs must be shorted together (i.e. short the SDIO input to the SDIO output). This buffer is unnecessary for the mbed, because the mbed already runs at 3.3V logic. Refer to the Sparkfun schematic for more information about the way this buffer is connected. The necessary wiring connections between the mbed and the Si4735 shield are listed in the table below. Remember that pull-up resistors are required for the I2C (sda, scl) lines. When soldering header pins to the Si4735 shield for a breadboard, it is recommended that only the pins on the bottom left (pins 8-13, GND, and AREF) be soldered. The pin holes on the shield are custom fitted for the Arduino, and the shield will not fit into a breadboard if all of the pins are soldered. Instead, you can solder flexible jumper wires to the 4 remaining required pins (2, +3.3V, GND (2)). If an FM antenna is not available, a single wire can be soldered to the FM antenna input. The radio will get good reception from strong radio stations in this configuration. The following demo sets up the Si4735 as described above with the MPR121 Capacitive Touch keypad and 16x2 character LCD display. The keypad is used to dial in the station frequency in 10s of KHz (e.g. 9-9-7 for 99.70 MHz FM), and then sent to the radio by pressing 10. The LCD display displays the current station and any frequency entry over/underflows. Here are the connections necessary for the keypad and LCD. Here is the library for the Si4735 radio interface. Below is the code for the sample program. I have a quick question. I've noticed most cell phones with built-in FM radios require you to plug in headphones, which acts as an antenna. Do you how this can be done using the Si4735? Connect the antenna directly to GND (can you quickly experiment with this please? It can't hurt)? Maybe isolate the headphone's ground wire from the ground somehow? I've seen this feature on products too, and my lab partner and I had initially thought that the headphones might serve as the antenna for the shield. But looking at the schematic, the the FM antenna input FMI is isolated from the analog audio out pins LOUT and ROUT, so without modification of the shield, a separate FM antenna is a required component. A simple wire soldered to the input served as a pretty decent antenna for the system. If you wanted to use the headphone's ground wire as the antenna input, I would think that it's possible, but I would imagine that there's some filtering required to remove the low frequency analog audio from the higher frequency FM signal. This could probably be done with a high pass filter, since the audio frequencies would top out at around 20KHz and the FM carrier frequencies are in the MHz range. This could all be a moot point though. We were advised that the headphone jack needed amplification to be able to hear anything, and we tested our setup with a set of computer speakers. I've seen this feature on products too, and my lab partner and I had initially thought that the headphones might serve as the antenna for the shield. But looking at the schematic, the the FM antenna input FMI is isolated from the analog audio out pins LOUT and ROUT, so without modification of the shield, a separate FM antenna is a required component. A simple wire soldered to the input served as a pretty decent antenna for the system. If you wanted to use the headphone's ground wire as the antenna input, I would think that it's possible, but I would imagine that there's some filtering required to remove the low frequency analog audio from the higher frequency FM signal. This could probably be done with a high pass filter, since the audio frequencies would top out at around 20KHz and the FM carrier frequencies are in the MHz range. This could all be a moot point though. We were advised that the headphone jack needed amplification to be able to hear anything, and we tested our setup with a set of computer speakers.